The BMC P2 is a new lightweight Nasal Pillow Interface. The ultra lightweight and minimal design makes the mask easy to assemble, wear and clean. The innovative design means the mask has more movement and flexibility, meaning there are minimal mask leaks. Most importantly it is so light and comfortable, while wearing you can hardly feel it. 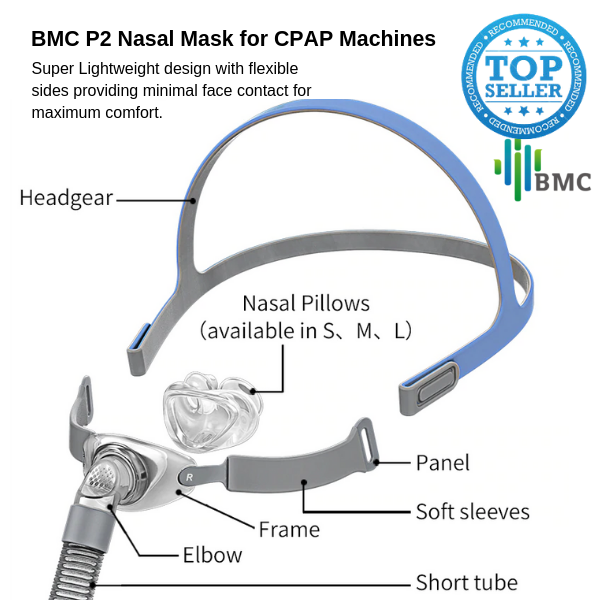 The BMC P2 mask is one of the best affordable range of nasal pillow interface masks available in the market. They have a very soft silicon insert that fits into the nostrils making therapy comfortable. This mask can prove a more effective solution for some users, particularly those that are prone to suffering from claustrophobia, allergies to interface materials, patients with mustaches and beards as well as those who have a narrow nose bridge and smaller faces. The BMC P2 Nasal pillows provide a greater range of vision, leaving fewer marks on the face and can often be more comfortable. Each pack of BMC P2 Nasal Pillows comes with three sizes of nasal pillows so the user can fit the most suitable ones. The BMC P2 Nasal pillows are recommended for patients who sleep with their mouth closed and are able to exhale though the nares. The BMC P2 Nasal Pillows Interface is to be used by adult patients >66lb/30kg for whom positive airway pressure therapy has been prescribed. I did write a review but I didn't realise that you used Google scripting which I would have regretfully permitted briefly had I known. So when I submitted I was told I got the Captcha wrong. I'm sick of those nasty captchas anyway so I couldn't be bothered to go through the hoops again. I can tell you that my wife is very pleased with the mask and I will probably buy another for me when my current outrageously priced Resmed needs replacement. Happy with comfort & performance. Would be good if the 2 spare nasal fittings could be exchanged for extra correct fittings. The BMC Nasal Pillow mask is an excellent, affordable choice of CPAP mask. It's very comfortable to wear, and SO much easier to take off and put on than a full face mask! HI Robert, Hope to hear form you once you've used the mask more. My second set. Wish I could opt for a size though. I have no need for the small and medium. More Large for me would be good to alternate for hygiene. This product is so comfortable to wear that has no air noise and vent noise. Was able to use it with my Phillips CPAP. Hard to get right if you sleep on your side. Best value on the market though. Response from HomeMed - Thank you for your review. We often suggest trying a different pillow, softer or firmer. You can also try a specially design cpap pillow. That should help with any issue you're having!